emails regarding disaster relief efforts are below. Teams returned from a weekend trip to Carlisle Baptist Church in Panama City. Our teams did a great job cleaning up around the church and getting the debris to the road. Also cleaning up in the buildings that they will be using until they can rebuild. 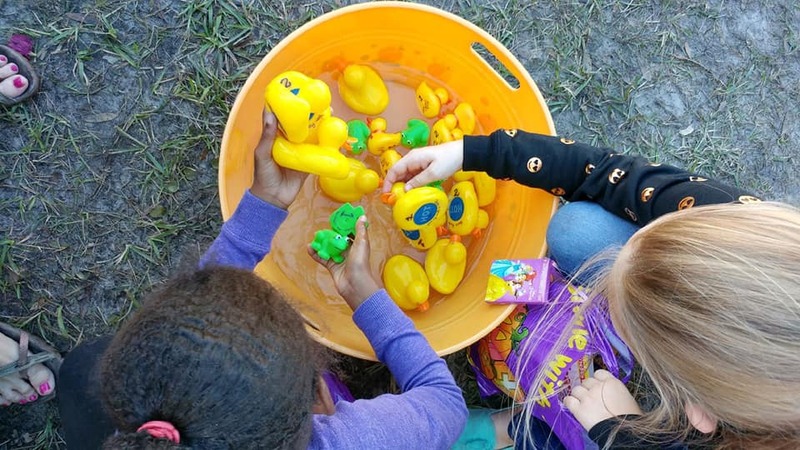 This church has a great connection with their community and we are so blessed to be able to support them. Please continue to be in prayer for Pastor Josh Fiddler as he leads the congregation through this time. We will be making one more trip November 29th-December 2nd to work in the community with debris and tree removal. We will be leaving approximately 7AM Friday morning. This is a church to church relief trip so no age limit or badge is required. Please contact Stan if you would like to go at 228-217-6637. To see pictures of the recent trip please click the link below! 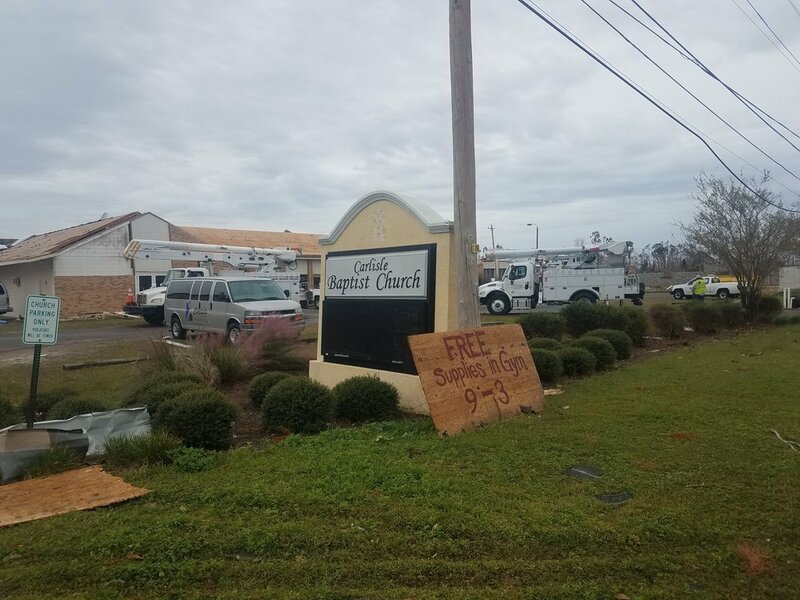 First Baptist Church Gautier and Jackson County Disaster Relief are planning a trip back to Carlisle Baptist Church in Panama City on the weekend of the 17th to start demo of interior walls, grounds clean up, roof patching and tarping. This church has been helping their community even though their property has been devastated. We had a great turnout with the Fall Festival there. let's keep up the momentum. The church has room for cots and showers. If you would like to stay overnight, we will be leaving Friday early evening. You can arrive on early Saturday if you would like. Any help will be appreciated. If you are interested going, please reply to this email or contact JCBA at 228.769.7101. In the future, there will the other weekend trips. If you would like to plan a short term trip to help hurricane victims, we have several contacts in South Carolina, Georgia, and Florida. We can help you arrange housing. In Panama City, Immanuel Baptist Church is providing meals and a place for volunteers to sleep on cots. Teams are still needed for debris removal, mud-out, tree cutting, and tarping. Trained DR Volunteers and untrained volunteers can be used. Let us help you prepare to help the many disaster victims. Please pray fervently for the storm victims, emergency personnel, and Disaster Relief Volunteers. Please be in prayer as we go to help with not only physical needs but with spiritual needs. Most people have forgotten the struggles that remain in Florida, Georgia, North Carolina, and South Carolina. Don’t forget to remember them in prayer. As mentioned earlier, lead your church to actively be involved in meeting the needs of hurting people. FUNDS: You may donate to the JCBA Disaster Relief Fund by mailing a check to PO Box 1726, Pascagoula, MS 39568. Please designate on the check "Disaster Relief," but preferably not to a specific area. This gives us flexibility in using the funds where they are deemed to be most needed. SUPPLIES: JCBA continues to collect a limited mud out items (gloves, masks, flat shovels/snow shovels, pressure washers, and garbage bags) and cleaning supplies. You may bring the items to the Association's Office at 3713 Hospital Road in Pascagoula from 8 to 4:30 PM Monday thru Thursday. If you would like to help, please let us know. We need you. Below is a slideshow of our newest partner Carlisle Baptist Church in Panama City Florida. They have suffered much damage in the hurricane and have lost their sanctuary. Please be in prayer for Carlisle Baptist Church as they walk through this time and reach out to their community.